Pre-plan your pasture rotation by creating a series of detailed farm maps that explain every part of your cattle farming strategy. This map-making process is an essential part of developing a comprehensive farm business plan for your beef business. After all, your farm plan is the blueprint to your entire cattle business. The example farm business plan showcased below and on the next two pages of this article series shows how all the principles and practical 'how-to' information described in my book Grass-Fed Cattle: How to Produce and Market Natural Beef can be boiled down to a very simple farm plan. This page - Part I of the farm plan - focuses on the summer pasture rotation. Use it as a guide to help you plan your own cattle business in a consistent, logical, step-by-step process. The series of farm maps in this example farm plan will walk you through every step of a grass-fed beef business, from cow-calf to grass-finished. You'll also notice that the layout of the grazing rotation is so simple that it will continue to work equally well even if, at some point in the future, the farm in this example chooses to specialize in only one part of the beef production process, such as only cow/calf, only stockers, or only grass-finishing. Keep your farm plan and pasture rotation simple. By the time you are done designing your farm maps, you should be able to give your plan to anyone familiar with basic cattle farming principles and they should be able to successfully manage your farm without you having to give them another word of instruction. This farm plan is for a cow-calf to grass-finished beef operation with a brood herd of approximately 100 cow/calf pairs. 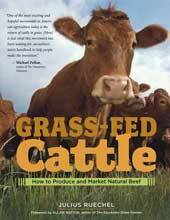 Based on the quick-reference table on page 278 of Grass-Fed Cattle, if in the future this farm chooses to focus on only a single portion of the beef production process, this same land base would support approximately 175-200 cow/calf pairs as a stand-alone business, or 200-300 grass-finishing animals, or 300-400 stockers, depending on breed, length of time spent on the farm, slaughter age, and weight at the time of purchase and/or sale. The growing season on this farm lasts from beginning of May through end of September. The winter pasture rotation is expected to continue through the entire winter (through the snow), with minimal to no stored feed required, but with a well-designed supplement program to support the winter pastures to ensure that nutrition keeps body condition scores within a safe range. All cattle are combined as a single herd (cow/calf, stockers, grass-finishing animals), excluding the bulls outside of the breeding season. Two exceptions to this rule are during weaning (until the cows dry up) and during mid-winter to extend the grass-finishing season, but these exceptions are discussed further in the farm plan below. Since this example farm plan is meant to help as a planning guide for your cattle farming business plan, I have purposefully excluded acreages, dimensions, and location to avoid confusion. Stocking rates vary considerably depending on climate, soil fertility, fertilizer use, irrigation, length of growing season, pasture yield, and so on. You will need to determine what stocking rate is appropriate for your business. But the basic ideas and principles at work in the pasture rotation will be the same, regardless of farm size. You can learn more about how to organize your own farm plan using transparent map layers in your computer software drawing program here. The farm plan layers below follow the electric fence, cattle water, and pasture rotation planning process described in the Smart Electric Fence Grid article series. 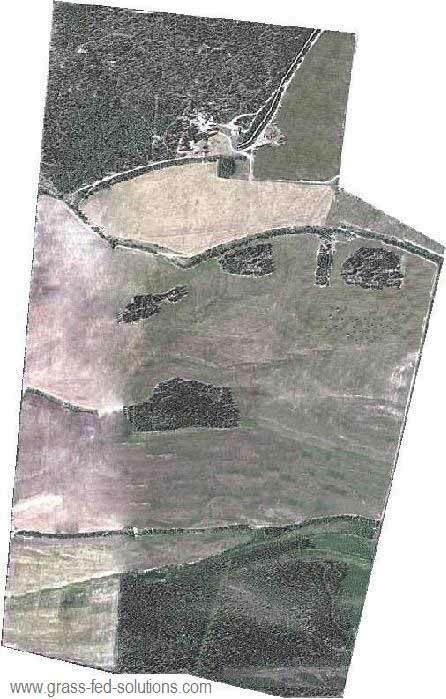 An air photo provides an excellent overview of the basic layout of the farm, but air photos are too 'busy' for planning all the details in your farm plan. Create a clean simple farm map for planning all the rest of the components of in your farm business plan. It is useful to airbrush out existing fence lines on a copy of your air photo so you can focus on designing the most efficient electric fence grid that makes sense for your topography and your grass fed beef production strategy. Click on the link for more tips on how to deal with existing cattle fences. The old fences on this air photo took less than 2 minute to airbrush away using the Healing Brush Tool or the Spot Healing Brush Tool in the computer software drawing program I recommend here. Keep the air photo as a base layer in your software program, which you can show or hide, as needed, underneath all the other visible layers in your farm plan simply by clicking the 'eye' symbol next to the layer. This layer shows all the important features on the farm - topography, water features, general soil types, timber, pasture land, ridges, gullies, and roads. Use this layer to plan all other aspects of your farm business plan, while hiding the busy air photo from view. If you plan on using a mobile cattle water system to supply livestock water to your pasture rotation, it's also useful to draw a basic cross-section of your farm. The example farm is composed of a series of flat benches with step banks descending towards the river at the bottom of the valley. This topographical cross-section naturally suggests how to set up water-lines for the mobile cattle water system and where to put drain plugs (the benches slope away from the river!) to help drain the system before winter. The next map layer should contain just your electric fence infrastructure for your rotational grazing program. Single-wire electric fences are shown in yellow and single-wire gates (with under-gate leadout wire connections) are shown in red. The cattle water alley (also built using single-wire electric fences) is shown in brown. It allows cattle to be easily moved between any part of the pasture rotation and the corral (i.e. for treatment or on sale days. The permanent electric fence corridors are slightly narrower than a single spool of portable electric fence wire. The daily pasture rotation through these permanent electric fence corridors will be controlled by using temporary portable electric fences. All interior fences are built with swivel-lock electric fence insulators. Large-scale topographical features and different soil types have also been fenced separately for improved pasture management. Each electric fence corridor has its own individual cut-out switch where it branches off the perimeter fence to allow individual corridors to be turned on or off as needed for maintenance (or during the winter) without affecting the remainder of the electric fence grid. 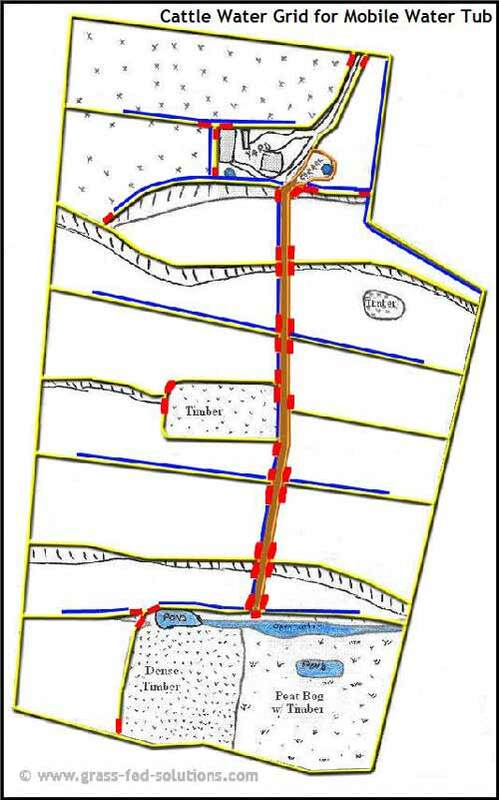 Blue lines show the polyethylene water line network overlaid on the electric fence grid. This network of polyethylene pipes (1-1/4 to 1-1/2" diameter) supplies cattle water to the mobile cattle water tub that accompanies the summer rotational grazing program. Water lines are pressurized from the well in the farm yard. Pressure losses or gains caused by gravity, friction inside the pipes, and pipe diameter have been calculated using the reference tables in the "Your Grazing Infrastructure" and "Livestock Water" chapters of Grass-Fed Cattle, which provides step-by-step calculations for designing your mobile cattle water system. The polyethylene water lines are laid above ground, directly underneath the electric fences to protect them from trampling. As an alternative to burying the polyethylene pipes where they cross alleys or gates, the water lines are protected via short sections of 2"-diameter steel pipe, through which the polyethylene pipes have been threaded. These pipe-protected crossings are then covered by sand or gravel, creating raised gravel humps similar to speed bumps in a school zone. This strategy avoids creating low spots in the polyethylene pipe which are difficult to drain in advance of the winter. The mobile water tub connects to the water lines via quick-connect couplers installed at intervals along the above-ground water lines. Green arrows show the summer pasture rotation through the prime grazing areas. The pasture rotation 'flow' is designed to create a simple, easy loop around the whole farm without creating any pasture moves that require long migrations. Daily moves are always to directly adjacent pastures using the front fence, back fence, next day's front fence cross-fencing strategy described in the portable electric fences article. 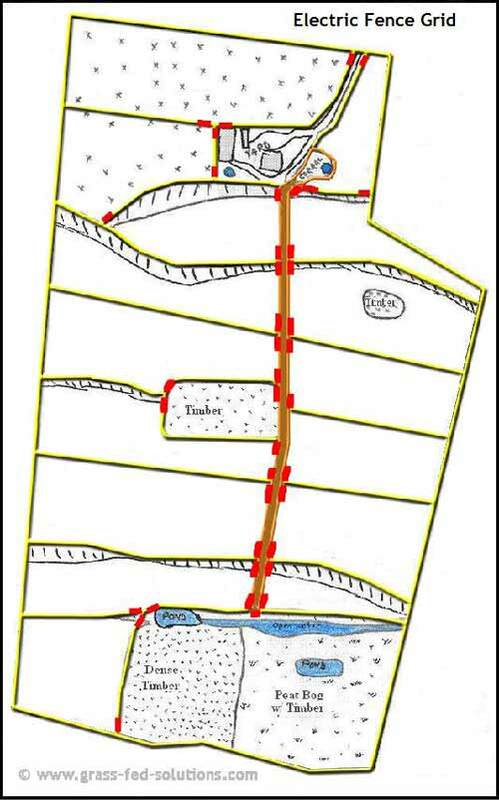 The pasture rotation has been planned to avoid cattle having to cross over exposed water lines during pasture moves. 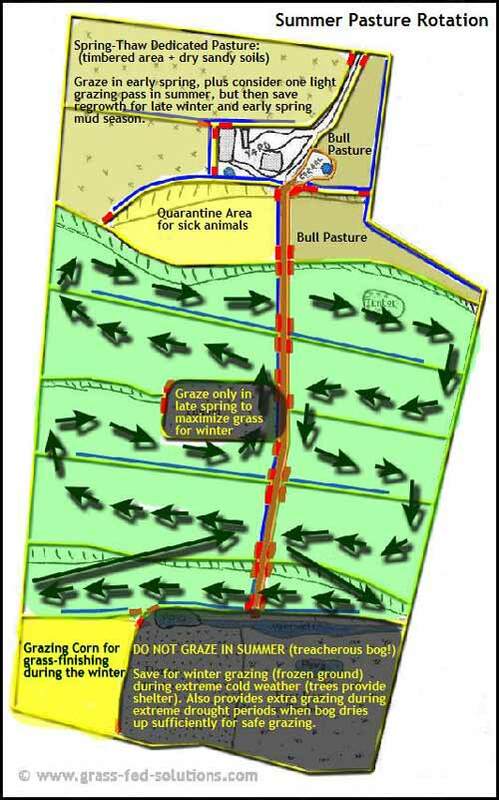 Green arrows shown crossing permanent electric fences in areas of the diagram where there are no red gates are using swivel-lock electric fence insulators to create temporary gates for the pasture rotation. Highlighted areas (grey and yellow) are addressed separately in Part II and III of this article, under the headings: 'Sick Animal Treatment Protocol', 'Bull Grazing Areas', 'Annual Grass-Finishing Crop', 'Spring Thaw Pastures', and 'Cold Weather Grazing Reserves'. to see how to set up and manage the winter pasture rotation. 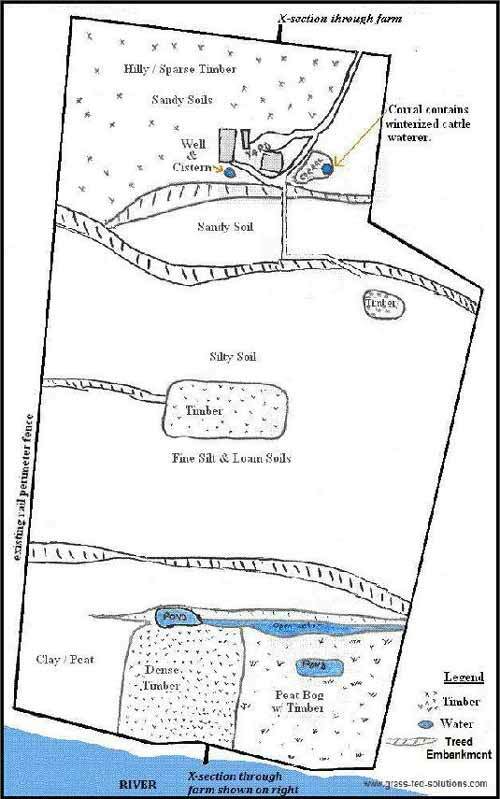 Part III of the Example Cattle Farming Plan - Farm maps of the grass-finishing, calving, and weaning strategies, as well as the sick animal treatment protocol, bull herd management, and drought/emergency plan. The Smart Electric Fence Grid - a four-part article series on how to plan and build your electric fence infrastructure for your pasture rotation.